It’s now officially summer time in the UK, which means the entire population of Britain will be cramming itself into every park, beach, and public space it can find for the next six months, until the darkness comes to claim us once again. More importantly however, today is April Fools, which means, as normal, that things are getting silly. It’s pretty early in the day, but there are already plenty of gags popping up all across the industry. You can check out a full rundown of everything we’ve spotted so far further down this article, but there are already UFOs showing up in War Thunder, a dating-app themed new addition to World of Warcraft, and a particularly surprising Rayman-related cameo. Of course, this is only a small slice of the silliness you’re likely to uncover over the course of the day, but it’s a decent place to start if you’re trying to ensure you don’t fall for anything too ridiculous. But without further ado, let’s see what’s popped up so far today. War Thunder has thrown off its earthly shackles thanks to Earth Thunder, an extraterrestrial take on its traditional war games. 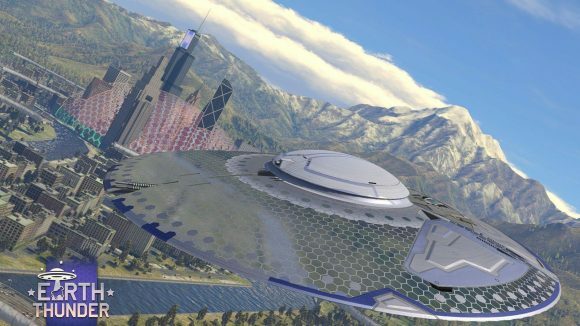 The new event replaces War Thunder’s arsenal of tanks and planes with the Universal Fighting Orbiter, which reaches top speeds of 800kmh, and works in the air, on the ground, and even under water. If you’ve been struggling to round out your latest raid group, Blizzard has the answer. World of Warcraft’s companion app now comes with Findr, which will give you three seconds to look over a player’s gear and achievements before forcing you to swipe right to send a party invitation, or left to brutally dismiss them (and their hopes of taking down Mythic Jaina). Bohemia Interactive is proud to announce its new theme park. Located in the north of the sunny Czech Republic, Bohemia Sandbox will feature zones inspired by some of the company’s biggest games. That’ll include DayZ World, in which visitors can ride on a five-hour rollercoaster and enjoy some post-apocalyptic food and drink, and Arma Verse, which Bohemia describes as “the world’s largest live action role-playing event.” Sure, you’ll be able to try out the odd military simulation, but more importantly there’ll be plenty of farm labour and mine work to keep you busy. After a shaky start from BioWare’s latest outing, the mod team behind the game’s official subreddit appears to have cut its losses and sided with another popular loot-shooter. Today, the Anthem subreddit is an homage to Ubisoft – Javelins make way for mercenaries, and the game’s Alien world is replaced with Washington D.C. in a nod to The Division 2. Riot keeps up its April Fools tradition with some silly, but deeply adorable, cosmetics in patch 9.6. Corki takes to the sky on the back of a Corgi, while the normally ferocious Yorick and Rengar both show up to battle in some fetching cat onesies. If that wasn’t enough, there are also some pretty bogus in-game tips doing the rounds, which I wouldn’t take too seriously if I were you. The Raving Rabbids have already shown up in some weird spots. 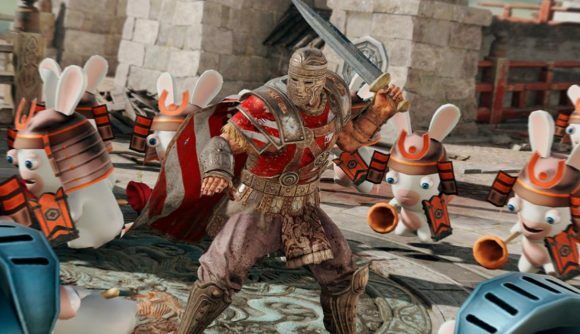 There was that XCOM-style Mario game, for one thing, and their brief cameo in Rainbow Six Siege, but today only, Rayman’s greatest foe has turned up in For Honor. Battle.net, Steam, Uplay, Origin, Epic Games store. The number of launchers you need on any given PC is growing at a seemingly exponential rate. Thankfully, Corsair has a solution – a launcher designed to help you manage all those other game launchers you have to worry about. Creative Assembly has announced a brand-new mode for Total War: Three Kingdoms. Mobile mode “simulates the extreme mobile graphics experience that fans have been crying out for.” Perfect for if you want to dominate ancient China while on the move. Announcing a new gameplay mode for Total War: THREE KINGDOMS – Mobile Mode! Totally Accurate Battle Simulator is (really, truly) out in early access today, after years of April Fools-themed jokes from developer Landfall Games. But even though their game is actually out, the developers couldn’t help but sneak in a cheeky Rick Roll for those booting up the game today. There might be plenty of Sniper Elite games in the works, but if you fancy doing a little less shooting and a little more loving, then Sniper Elite: Love in Your Sights, a romantic narrative experience, could be for you. In case you missed our very own April Fools efforts, then look no further. We were privileged to announce that Valve’s iconic MOBA would be getting a sequel – releasing on none other than the Epic Games store – but sad for Vince Zampella. The Respawn CEO says that he’s disappointed that Apex Legends fans just aren’t as horny as Overwatch’s. Of course, it’s still early in the day, so there’s plenty of time for more nonsense later this afternoon. Just remember, if you see something today that looks just that little bit too ridiculous to be true, it probably is.